Not that we're complaining or anything, but sometimes it seems like Taco Bell's go-to strategy for creating new menu items is to take its usual core ingredients -- meat, cheese, sauce, and toppings -- and slap them together in a slightly different way or larger form factor. As evidenced by the Triplelupa, there's absolutely nothing wrong with that. But it's still refreshing when the chain does deviate from its usual formula, even if just a little, like in the case of its new Buffalo Chicken Nachos. Yes, buffalo chicken at Taco Bell. The new creation is officially dubbed the $5 Buffalo Chicken Nachos Box, and it's unlike anything on T-Bell's current nationwide menu. In fact, if you search for "buffalo" on the menu right now, nothing comes up. 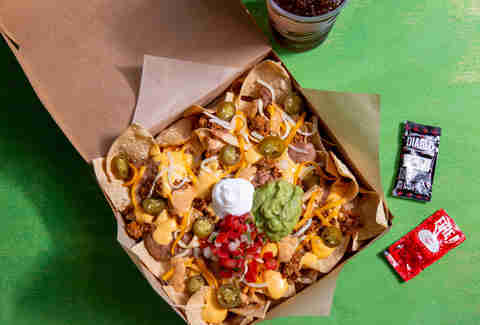 That could soon change with the introduction of these new nachos, starting with a test launch at select locations in Charlotte, North Carolina on December 27, according to a company spokesperson. 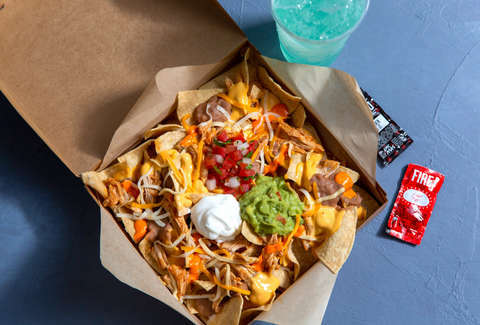 Taco Bell appears to position the new test menu item as a combo deal: "This nachos box is filled with refried beans, warm nacho cheese sauce, a three-cheese blend, shredded chicken, buffalo sauce, sour cream, pico de gallo, and guacamole all placed on top of a bed of nacho chips and served with a medium drink for $5." But, let's be real here, they look like an appetizer or side order to eat with your usual bag of tacos and Crunchwraps. While objectively less exciting than buffalo chicken, Taco Bell said it's testing a similar item in Milwaukee, the $5 Cheesy Jalapeño Nachos Box. This version is made with nacho chips, beef, refried beans, nacho cheese sauce, a three-cheese blend, pico de gallo, creamy jalapeño sauce, jalapeños, and sour cream -- all in a box alongside a medium drink. Both nacho boxes will be available in their respective test markets through mid-January of 2019. As for when the nachos will arrive on Taco Bell's nationwide menu, well, the company won't say, but it'll all depend on how well they sell in Charlotte and Milwaukee. So, to the citizens of both cities, we urge you not to screw this up for the rest of us (we'd all do the same for you).